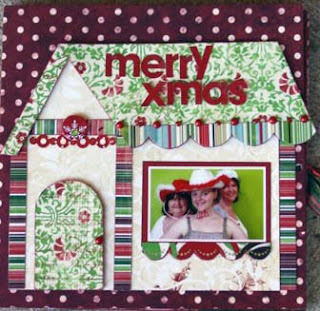 Here is one page from Marion Werren's beautiful class. PHOTOS: 4” x 6” Portrait Colour (4), 4” x 6” Landscape Colour (2), 2 ¼” x 3 ½” Landscape Colour (1) for the front of the house. sneak peak of one other page. We will also be having in the shop on the day some Mystery Diva Paper & Flower Packs ranging in price from $2.00 to $15.00. The flower packs are jammed packed with all sorts of flowers and the paper packs have matching papers with embellishments. It will be like a lucky dip and you won't actually know what you have received until you unwrap your parcel. So make sure you sign up for the classes and the kits as soon as possible.